It goes without saying that socks are an essential part of hiking. A simple mistake in choosing the wrong socks will lead to myriads of problems while hiking including sweating, hotspots, frostbite, discomfort and even blistering. You won’t need this to happen to you as you enjoy your hiking experience. Your feet are undoubtedly the most important tool during hiking. They are a means for you to move from one place to another, your ultimate method of travel and if not cared for well, your hiking experience could quickly turn to be misery. That said, you need not worry much about buying quality socks as there is not specific time for buying hiking socks for your kit. Arrays of companies have cropped up to develop softer, warm, and breathable hiking socks like never before, by use of considerably next level tech like merino wool. It may seem as improper to wear woolen socks during hiking, especially during the summer. However, research has shown that natural fibers have many benefits to the feet especially during hiking. More so are the benefits more pronounced if the natural fibers come from merino sheep. You will be surprised to learn that the same woolen socks that keep you warm during winter hikes will also keep your feet cooled during the summer. Woolen hiking socks will not only absorb the moisture from your feet but will also expose the sweat to the air outside the socks with ease, thus cooling your feet. It’s for this reason that woolen socks are considered to be the best anti blister socks for hiking. While woolen socks are considered to be the best for hiking, socks made of cotton pose hazardous effects on your feet. This is because cotton will drench your feet in sweat more quickly compared to woolen socks. The worst thing is that once your feet are socked in sweat, they hardly dry up on time, which poses even more danger to your feet. During hiking, your feet will experience a lot of sweating, more so during summer. In a bid to cool your feet and reduce the rate of perspiration, it’s important to choose lighter socks for your hiking. 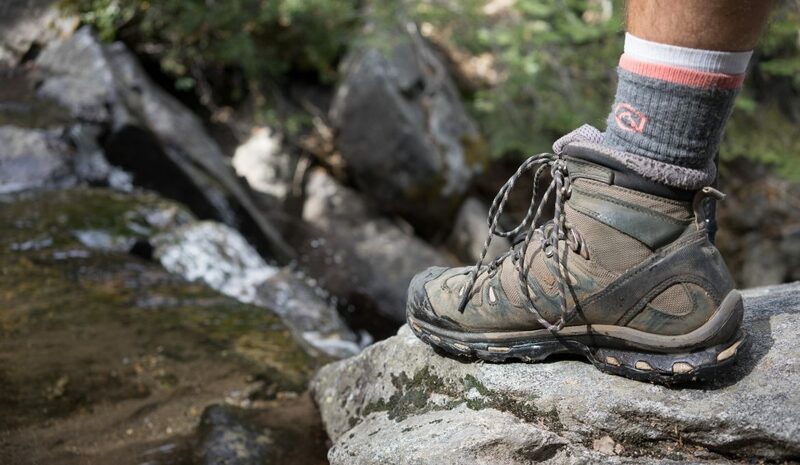 It’s important to take note that even though lighter socks will always be thin, lightweight socks that are specifically designed for hiking have an extra cushioning both at the ball of the feet and the heel. This way, you won’t feel uncomfortable at all. Traditionally, hiking boots usually go beyond the ankle. In looking for the best hiking socks to buy, you should consider the height of your boots. This will help avoid any bruising on your ankle by the hiking boots. Even so, if you are wearing low rider shows, look for hiking socks that go way to your cuff. This will tremendously help in keeping your feet cooler and more comfortable. Additionally, having a cuff length sock will help prevent your feet from any bruises while hiking.